ISO 9001:2015 – WE’VE PASSED! Prima Uno are delighted to announce that we have successfully passed the Stage 2 ISO 9001:2015 audit. We have been recommended for certification with no issues identified. Thank you to all who helped us on our journey! Take a further look at all other categories, sponsors and shortlists here! Get it right first time to avoid pain when the project is in flight! Getting the accepted programme compliant and understanding the contract and its clauses is essential. The accepted programme is vital in approving the accurate state of the project at any one point in time. All submitted programmes include the progress, planned sequence of activities, early warning and effect of any compensation events that may have occurred. Here at Prima Uno we can review your proposed accepted programme and ensure it is aligned to the NEC contract and is accepted first time! We can evaluate your schedule or project from any angle, giving you true visibility and assurance on the deliverability of your project or programme. More importantly we can offer a more personal viewpoint by making sure that any analysis or evaluation of a schedule is undertaken and reviewed by an appropriately experienced and competent consultant that places the outputs from any evaluation into perspective. Prima Uno has the advantage of offering specialist project controls capabilities as well as project and programme management professionals. Not only can we analyse your schedule but we also have the capability to implement improvements and make the right recommendations to move you forward, for example: remove redundancies and unnecessary constraints, fix logic integrity, mature schedules and assist in developing delivery strategies along with then re-importing schedule straight back into your project management software of choice. We can analyse tens of thousands of activities across multiple projects and platforms in seconds, providing you with a true view of the project as a whole with your key project management tools to improve the soundness and reliability of the schedule. Our reporting and analysis capability would also give you valuable insight into the “probability of success of the deliverability of your project / schedule”. Coupled with our Quantitative Schedule Risk Analysis capability we can provide a full Lifecyle approach, or a more tailored solution specific to your needs. Prima Uno also provide services to assist Clients when claims and disputes unfortunately arise. Clear understanding of various forms of contract. Ensuring the establishment of a clear baseline which fully aligns to the contract and from which contract entitlements can be assessed. Prima Uno, announced Friday 10th March as the date for the official opening of their new offices, two new businesses P4M Portfolio, Programme and Project Management consultancy www.p4m1.co.uk and Prima Uno Training www.primaunotraining.co.uk and forensic / business intelligence lab at Phoenix Court, Cleator Moor. 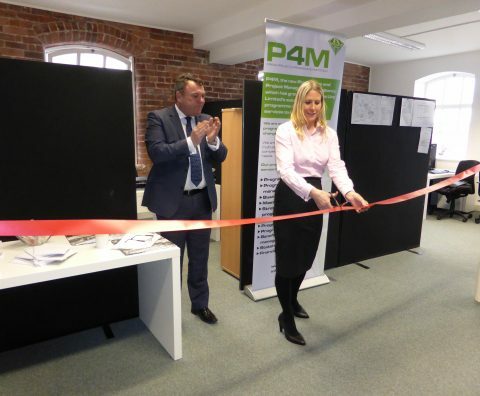 Cutting the ribbon on the new premises was Stuart Wilson – Supply Chain Ombudsman at Sellafield Ltd. Reflecting the value of such a specialist business to Britain’s Energy Coast, the guest list includes clients from across the country including many BECBC members some of which were LLWR, Sellafield Ltd, PacTec, WYG, Burnett’s and other Tier 2 and 3 companies. The official ribbon cutting ceremony was conducted by representatives from Sellafield. Mr Wilson, said: As a local Small to Medium sized business, Prima Uno continue to go from strength to strength, demonstrating all of the technical experience required to succeed in a wide range of business opportunities that are available locally, nationally and internationally. I wish them every success in their journey of growth. Prima Uno is now just over four years old last September, but has already made an impact on the international stage, contracts across the UK and in discussions for a contract in Europe. This highlights how the company’s skills can be transferred across many sectors. For more information about the Prima Uno, Prima Uno Training, P4M or The Lab, visit www.primauno.co.uk www.primaunotraining.co.uk www.p4m1.co.uk or contact Sarah Purdham on 07515 431245. Prima Uno’s new Portfolio, Programme & Project Management consultancy P4M has now launched its own website. Following the growth of P4M’s strategic & programme management portfolio there are plans to open a Manchester and London office to cope with demands from other high profile UK and international projects such as the new Heathrow Runway. If you would like any information about Prima Uno, P4M or Prima Uno Training please visit the websites below or call 01946 817209. BECBC Awards 2016 – We Won! Prima Uno are absolutely delighted that we have won the Britain’s Energy Coast Business Cluster (BECBC) “Growing Business of the Year” Award at this year’s Business Awards which took place at Energus on Thursday 17th November 2016. Winning this award means so much to everyone at Prima Uno, it gives us greater exposure and recognition for our hard work. We continuously work hard and try to secure new projects in new sectors. The next 12 months are exciting for Prima Uno with new offices in the UK planned, gaining ISO 9001 accreditation, securing new contracts and continuing to grow sustainably. Britain’s Energy Coast Business Cluster (BECBC) is a private sector led organisation founded in 2004, with 290 members drawn from across the broad spectrum of organisations working on Britain’s Energy Coast in Cumbria. BECBC has been instrumental in the growth of Prima Uno as we were introduced to many clients on joining.